In recent years the Crayford style of ball-bearing guided focuser has become popular due to its smooth motions, absence of pinion backlash, and rigid drawtube support. Baader's new Steeltrack Premium Focusers incorporate a number of innovative features that further enhance the smoothness and robustness of the Crayford focuser. Steetrack focusers are available to fit practically every telescope, from Refractors to Newtonians, and SCTs. The precision ball bearings ride on hardened and polished stainless steel ways that are inset into the thick-walled aluminum drawtube. The large diameter pinion drive also rides on a precision laser cut hardened and polished steel way. This important feature delivers an ultra-smooth motion that is superior to to the rougher motions of an aluminum bearing system, and guarantees that the buttery-smooth motions will remain that way over the life of the focuser. Crayford focusers that rely on machined and anodized aluminum bearing ways can become worn and pitted with use, which results in loss of smoothness and accuracy. The extra-large focusing knobs and Precision 1:10 reduction gearing permits ultra-fine motion control without backlash. Precision Pinion Drive and Bearing Assembly delivers an exceedingly smooth slipless motion and avoids the drawtube flexure present in other crayford focusers. Each Steeltrack incorporates a drawtube locking screw that supports even extremely heavy cameras and eyepieces without flexure or slippage. The knurled lock screw incorporates a swivelling anti-marring brass insert that allows firm clamping of the drawtube without marring or damage to the focusing mechanism. Internal drawtube surfaces are knife-edge baffled to eliminate stray light reflections. Bronze compression rings permit secure clamping of eyepieces and accessories without marring. Baader Precision and Quality. All parts are precisely machined and their high surface quality make the Baader Steeltrack an attractive complement to any telescope. Graduated markings on the drawtube aid in measuring and repeating focus positions. A complete set of adapters and extensions permit adaptation onto practically any telescope. 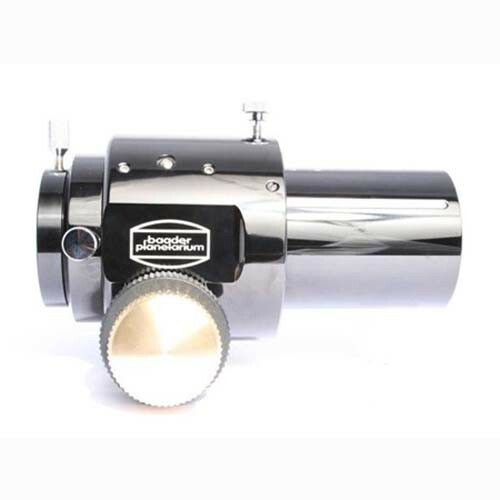 Baader Planetarium's 2" Refractor Steeltrack Focuser gives refractors a full 3.1" (80mm) of velvety smooth focusing travel. Easily adaptable to popular refractors. Overall length fully retracted 80mm (backfocus length). Drawtube is fully internally baffled and blackened to eliminate off-axis stray light. Includes 2"/1Â¼â€Â Reducer, with internal Bronze compression ring. Optical Path Length 10mm. 72mm dovetail receiver permits 360degree rotation of focuser with single-screw locking. Optional RT Adapterset permits easy attachment to Celestron/Skywatcher/Zeiss refractors, and is easily adaptable to other refractors. 1) The ID of this focuser's body is 72mm and OD is 82mm. Directly, this focuser can only slip over telescope tubes that are 72mm or slightly smaller in diameter. 2) The OD of the drawtube is 58.2mm. Any telescope tube you attach this focuser to must have an internal opening at least this large to allow the drawtube to pass through. (iv) RT2 Focuser + Complete RTAD (All 4 parts) = Focuser body converts to a male 96mm flange which allows you to use the focuser in tubes with an ID of 96mm or slightly larger. 4) Item weight = 2lbs without 1.25" eyepiece adapter; 2lbs-4oz with 1.25" eyepiece adapter.